If you picked calm & organized, you have come to the right place! If you saw the Pottery Barn inspiration picture on this page, you know my style- I love neutrals, whites & wicker. I love that look in an entryway because it brings me a feeling of happiness when I see it, and the entrance is the first thing that we see when we enter a home. Organizing the entryway is an important step to organizing your home. In our first house, we didn’t have a foyer or anything like that, so we had to make an entryway. I used the furniture layout to create a little “hallway” by having the back of the couch to the door (facing into the living room) and a small table on the other side, holding a basket and bowl, for our guest keys. I had a key-holder on the wall & a coat hook on the wall, as well. It was small, but it was useful and it worked out great! I loved the feeling when I walked into that house, just like I have liked the feeling of both of our houses since that first one. I also have a tall sofa-table in our entry way. I used to have a different blue & white decorative bench here, but I wanted somewhere to put my favorite vase (from my college suite-mate & friend, Maura). I didn’t want to keep it on the kitchen table, because I was afraid that it would break while being moved on & off for dinner. For this reason, the bench got moved to our blue & white bedroom and I found a great table to replace it! I have the vase on this wicker table and I love it! It is probably my favorite area in our home. A basket of sea-shells completes it (they remind me of Hilton Head Island, which I love). 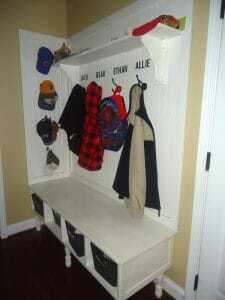 If you have a table in your entryway, you could set a nice, small basket here for keys, or have a spot to hang them up. You could also have a key hook when you come in (make one by getting a picture frame, taking out the glass & adding a great fabric that you love in place of it. 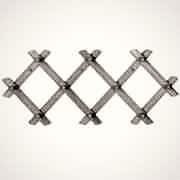 Just add some hooks & you have a beautiful key hook). We also have a wicker shoe basket by our front door that holds all of our shoes when we come in. It is great for guests. It sits on our sisal area rug (that I love!). 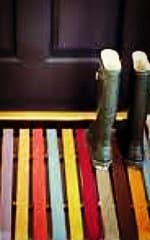 A boot tray is another great idea, like this one that Martha Stewart makes. They are easy to make and perfect for a covered porch (our outside of the back door!) I saw this in a magazine by Martha Stewart a year or so ago & loved it. To make it, cut sixteen 2-by-2s, to 24 inches long. With a 3/8-inch drill bit, make 2 holes in each board, one 6 inches from each end. Cut 6 feet of 1/4-inch sisal. Fold the rope in half and mark the center point. to make a handle, tie a knot 7 inches in each direction from that point. Thread each end of rope through the holes in the first board and tie another pair of knots (below). Continue to secure all the boards. Trim excess rope. Here is her indoor boot mat, too. (Martha Stewart picture below). It allows rain, snow & ice to melt off. 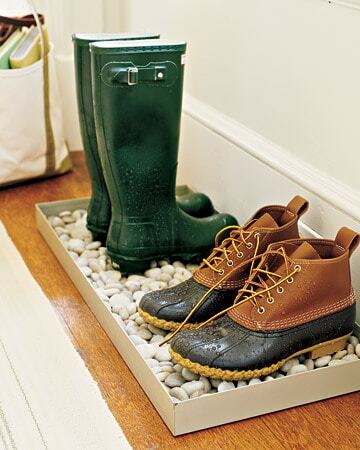 Just fill a boot tray (or any tray, really, that can get wet) with pebbles. The color in your entry way is important, as well. I like the color to be one that is peaceful, but whatever you like is what will welcome you home every day! I always go for a neutral color because I can easily change my furniture pieces and they will always match. Add what works for you! What does your entryway look like? 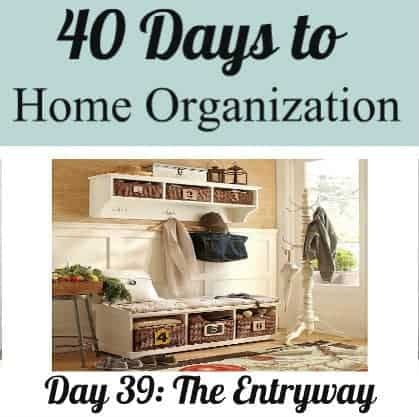 HERE IS THE INDEX OF OUR 40 DAYS TO ORGANIZATION– FIND ANOTHER TOPIC THAT INTERESTS YOU. enter your e-mail in the box below & hit GO!